It’s early morning here on the East Coast and #CyberMonday is just getting rolling. Yet our email boxes are already flooded with offers from retailers. Shopping chaos to shortly ensue? Certainly. To put things in perspective, on Cyber Monday last year U.S. shoppers spent over 2 billion dollars online (so can’t blame retailers for pestering us right?). Here’s the thing though… You don’t have to worry about sifting through those emails looking for discounts. We’ve got that covered for you. Just use our new Savings Guard feature to ensure that you’re completely protected from any remaining evil-y high prices! For hundreds of popular stores, Savings Guard will show a reminder notification at checkout, and then automatically try all the coupon codes. Just sit back and let it do the work for you. At the end it’ll apply the best code(s) which save you the most cash! Example: Let’s say you are purchasing a pair of shoes, and spot a 10% off discount code that you happily apply when checking out. Sounds good, right? Well without Savings Guard, you may never know that there’s actually an even better 20% off + Free Shipping coupon floating around the dark corners of the Interwebs. A simple click of a button and you just bagged an extra 10% + saved a bunch on shipping! It learns which coupons are still valid over time, the invalid/expired ones get weeded out. In the future there will be more options to control when Savings Guard appears. For example, if no current promotions are running, it won’t bother you. But if there’s even a chance of savings, it’ll be there for you! When a retailer accepts more than one coupon at once it’s called stacking. Savings Guard will automatically attempt to stack the best coupon codes together to maximize your savings. Watch it in action in this video. Note: that this feature is very much still in beta, and we’ll keep you updated as it progresses! Short version: Coupons at Checkout 2.0 with Savings Guard is a super simple time and money-saver so you’ll never have to overpay again! And you really only have to click one button to save... 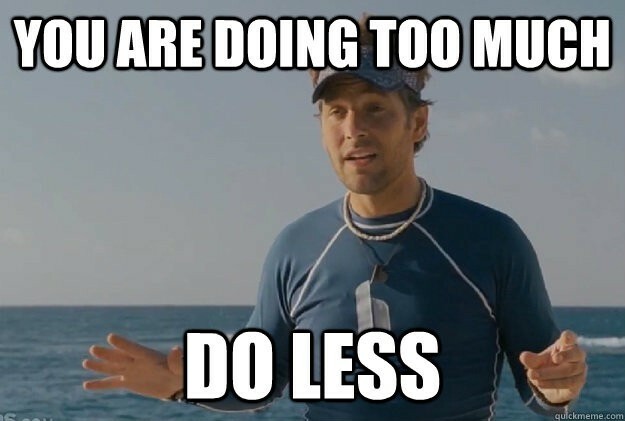 So listen to your buddy Paul Rudd, and do less (but save more!). Go grab it, join in on today’s shopping mayhem, but keep your mind at ease! Coupon search engine, and creator money-saving tools to help consumers save cash!